I am back with another journal page close to my heart. The idea came to me from the challenge on Mixed Media & Art blog and so my spread is about the forest- it’s beauty and the dangers which are falling upon it. I love forest, animal, trees. Green color gives me hope and serenity and I really wanted to put all of these feelings on my page. I started by applying heavy coat of gesso and dabbing it with spatula to add dimension. Then I sprayed it slightly with Lindy’s Starbursts: Golden Sleight Bells- I did not wanted to leave the page completely white. Then I added all the greens I wanted- Starbursts: Frosty Forest Green, Freaky FrankenLime , Tibeatan Poppy Teal and Flat Fabio- C’est la Vie Cerise. On the side I sprayed pieces of gause with Frosty Forest Green and Freaky FrankenLime and covered some raisins with black gesso. Background stamping comes from Creative Embellishments: Halftone Circle Stamp and Hero Arts stamp: Winter Trees Pattern. Brushstroke stamp was embossed with WOW! Black EP and there is also few others background patterns which were made by using old textured food packinging ( I love to use this technique for a background for few reasons- I still do not own too many stamps , I find that they are leaving unique and really nice patterns and, of course, they are super cheap:). I needed to use also Finnabair’s Art & Mini Art Stones and Antique Brilliance wax- Mystic turquoise ( for the wings of the bug, bird and leaves). Then came the embellishments- small branches with oak nuts, butterfly brads, die-cut leaves, black sisal, micro beads and two pieces of tracing paper stamped with the tree image ( Inkadinkado tree stamp). I added also two small pieces of metal to symbolise saws which are cutting the trees. The last touch were the stickers from Tim Holtz Small Talk. 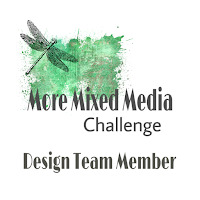 I am entering the August challenge on Mixed Media & Art blog. So lovely spread and many beautyful details. Just love them. What a wonderful forest scene!!! Brilliantly done! Thanks for joining us at MM&A! It’s wonderful! Thank you for playing with Mixed Media & Art!